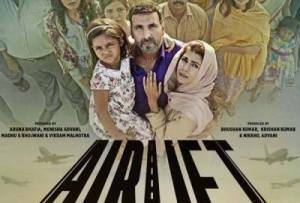 AIRLIFT is an edge-of-the-seat entertaining thriller. The story, based on a true event, is set in 1990 in Kuwait, the time of the Gulf War when Saddam Hussein invaded Kuwait. The film has Akshay Kumar, playing Ranjit Katyal, a wealthy and powerful Indian businessman, who initially considers himself a Kuwaiti rather than an Indian. But after finding himself and the lives of his family in danger, eventually becomes the man who helps evacuate 170,000 Indians from Kuwait and brings them back safely to India. Over 59 days, 488 Air India commercial airliners were flown into a war zone to evacuate 170,000 Indians and bring them back home safely. Writer-Director Raja Krishna Menon’s relatives were part of the Kuwait crisis. It must have been a story very close to his heart for he has poured tears, cries and trauma that only those who’ve been through hell can narrate. His direction leaves a hammer strong impact. Raja Menon is a director to watch out for. Suresh Nair, Rahul Nangia, Ritesh Shah along with Menon share the writing credits. Screenplay is gripping. There’s not a single false note. Dialogues are wonderfully written. At several junctures you shall get funny gems like ‘Reti mein kheti karoon kya’ and many more.